The MSc Global Ageing and Policy (DL) programme introduces students to the study of ageing over the lifecourse, focusing particularly on the principles of policy evaluation in ageing societies, and on the opportunities and challenges associated with ageing in specific regions of the world, including China, South-east Asia and sub-Saharan Africa. Following the successful completion of 6 taught modules, this programme also offers students the opportunity to conduct independent research through the MSc Dissertation, often with links to current research projects in the Centre for Research on Ageing. Understanding the challenges associated with ageing, and assessing academic and policy evidence in this area, are critical skills for employees in a range of professional environments. 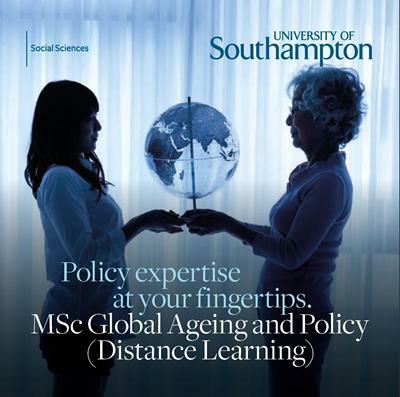 The MSc in Global Ageing and Policy (Distance Learning) introduces you to the study of ageing at a global level, and equips you with critical skills in conducting the evaluation of policies relating to older people's wellbeing. This programme will also allow you to specialise in ageing in particular contexts such as sub-Saharan Africa, China and South-east Asia. Enrolling on the MSc in Global Ageing and Policy can open doors to a range of careers in policy-related, medical or caring professions. Gerontology is the study of ageing at the individual and societal levels. It examines the changes humans undergo as they age, as well as the impact of growing proportions of older people on social institutions, labour markets, welfare systems and families. The study of ageing also investigates the relationships between generations and the interconnections between individuals’ experiences over the lifecourse. The postgraduate programme on ageing draws on a range of disciplines including social policy, demography, sociology, biology, health sciences, psychology and economics. Our MSc Distance Learners get to attend a residential course at our Highfield Campus in Southampton and meet their academic teachers as well as exchange best practice with fellow distance learners. The impact of the challenges caused by parenting orphans and vulnerable children to the health and economy of the older people in sub-Saharan Africa. Quality of care provided to people living with dementia by health care workers: A case study of a psychiatric hospital. A comparison of older persons social pensions schemes in sub-Saharan Africa: Impact and challenges. Challenges faced while caring for older person with dementia in residential care in Nairobi, Kenya: A caregivers’ perspective. We welcome applications from students holding, or expecting to hold, an upper second-class honours degree or higher, or equivalent. Students without the usual entry qualifications may be admitted, with the requisite approval, on the basis of relevant work experience or professional qualifications. Mature applicants without formal qualifications but with relevant experience are also welcomed and will be considered. For all applications, two academic references are required. Unfortunately, we cannot consider applications until we have received both references. If your first language or language of education is not English, we will ask you to show evidence of fluency in the use of English. For all of our postgraduate programmes we require a level of IELTS 6.5. For details of other English language tests which we accept, please see the International students section of our website where you will find a list of approved tests. If you require further English language tuition before commencing your programme with us, you may apply for one of our pre-sessional English language courses which are run by the Centre for Language Study. Full-time students take three modules per semester, six in total by the end of the second semester. The dissertation is submitted by the end of September of that year. Students on the part-time programme take two compulsory modules and one option module in each year of the studies. The dissertation is conducted in the second year and normally submitted by the end of December in year two. Please contact us for further details. Students select to study either Quantitative Research Methods (DL) or Qualitative Research Methods (DL). Students must select to study Ageing in Africa: Research and Policy (DL) or Ageing in China and South-East Asia (DL). Stationery You will be expected to provide your own day-to-day stationery items (e.g. pens, pencils, notebooks, etc.). Any specialist stationery items will be specified under the Additional Costs tab of the relevant module profile. Books Where a module specifies core texts these should generally be available electronically on the reserve list in the library. However due to demand, students may prefer to buy their own copies. These can be purchased from any source. Please note that the vast majority of readings in Gerontology are available electronically through e-journals, as digitised text in the Online Course Collection or as e-books. Students on the DL programme receive key textbooks as part of their tuition fees at the beginning of the programme via post. Some modules suggest reading texts as optional background reading. The library may hold copies of such texts, or alternatively you may wish to purchase your own copies. Although not essential reading, you may benefit from the additional reading materials for the module. Equipment Software Licenses- Licenses relating to software used in the programme (eg. SPSS, NVivo) are purchased by the University, and students can download them from the iSolutions website using their username and password. Equipment Hardware- Participating in the Distance Learning programme requires the student to access to a PC/ laptop. Students may also wish to purchase their own PC/laptop or tablet in order to access Blackboard. Headphones are sent to the Distance Learning students via post as part of their tuition fees at the beginning of their programme. Printing and copying For all GERO modules, coursework (such as essays; projects; dissertations) is submitted on line. Distance Learning students are provided hard copies of the MSc Student Handbook, Module Outlines and other key learning materials (eg. Module Outlines) via the post at the beginning of their programme, as part of their tuition fees. Conference expenses Where students wish to attend a scientific conference during their studies, they are liable for any accommodation cost associated (as well as any conference registration fees). Travel Where students wish to attend a scientific conference during their studies, they are liable for any travel cost associated. Other Anything else not covered elsewhere- Students on the MSc Gerontology (DL) or MSc Global Ageing and Policy (DL) programme who are in receipt of Commonwealth scholarships are invited to attend a 4-day Residential Course in Southampton, for which the travel, accommodation and basic subsistence costs are covered as part of their Scholarship. The distance learning programme employs a variety of teaching and learning methods, including audio-recorded recorded lectures, tasks related to the lectures, contributions to informal group discussion and independent study. A variety of assessment methods are employed, which include essays, oral presentations, exercises, research reports and the dissertation. All programme modules have their own page on Blackboard from which students are able to access materials (lecture slides and recordings, coursework details, references, module updates and comprehensive support and guidance on how to use online resources that are key to the programme). Distance learning students develop their skills in written and oral presentation through a variety of interactive online resources and software programmes. 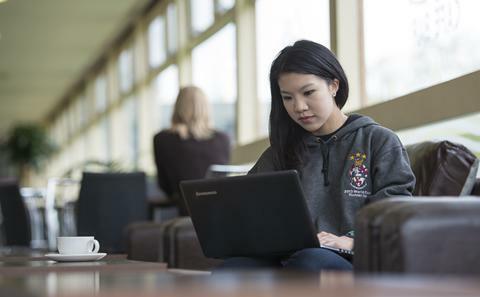 Students are given access to online resources provided by the University including a library resources, university email address, a range of software packages and computing support via iSolutions. All students are provided with a personal tutor who can advise on academic and other University issues, and a dissertation tutor who provides advice and support during independent research. Students are provided an induction to the programme, module briefings and information about the dissertation via dedicated audio-recorded and written materials.